This week (tomorrow specifically) is the one year anniversary of my little piece of the web. It's been a fun year -I have learned so much (& continue to learn something new about this craft daily), I've been blessed to have "met" some wonderful & supportive people (other bloggers), & I love that this is a creative outlet for me. I'm happy that I stepped out of my comfort zone to give this a go. Funny, as I was looking back at the original post this sweater was 40% off at the time. Well, Target has done it again & all sweaters are 40% off this week too. I still stand by what I said in that post & it's one of the main reasons for this blog - style doesn't have to be expensive! This blog isn't meant to be about me - it's about showing you that you can do it too! It's letting you know where I get my wardrobe from & how I get maximum use out of each piece. It's about encouraging you to put time into yourself, to put something on every day that makes you feel something positive (pretty, sassy, confident, happy, etc). I hope that this blog pushes you to try something new that you didn't think you could "pull off". This blog is for you - & I hope that's how it comes across. I thank each of you who comes by to read each post. I LOVE it when I hear from you about new shoes you got that were different for you, or how you added a great statement necklace to an otherwise basic outfit because "I said you could", or how you bought your first leopard print piece, or you mixed stripes & floral for the first time! Hearing those type of comments from you seriously makes me so giddy!! See - you can do this too! I also thank my family for dealing with the daily photos & "blogging tasks" - I couldn't do it without their support! I look back at some of my early posts & cringe...ugh, they are just bad in my mind, but that's ok because this is how I continue to grow & get better. This little blog isn't where I want it to be yet, but as long as I'm making forward progress I'm happy with the ride. I'm excited for ie-style's next chapter - big announcement coming soon, so stay tuned & again, thank you for reading! Happy one year blogiversary tomorrow Kellie! 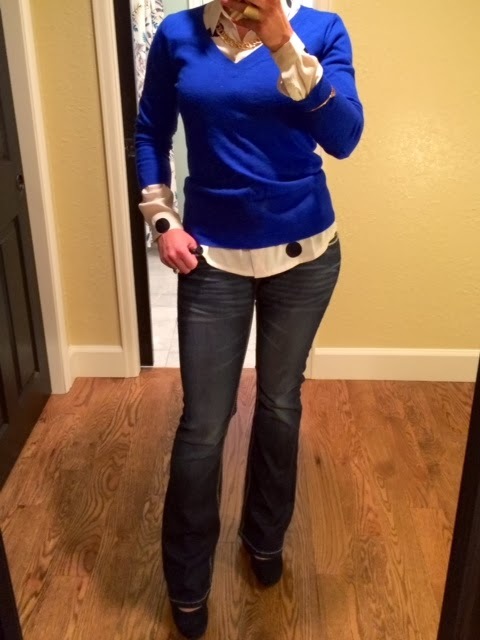 I loved reading your reflections on blogging and love seeing all the ways you've styled that sweater! You definitely have a great knack for re-purposing pieces and creating new combinations. That's what kept bringing me back to your blog from the first time I found you! And yes, we all have cringe-worthy posts in our past but like you said, it's just part of the journey and growth process! So glad to have met you through this "craft." Congrats and Happy 1 year blogiversary Kellie!! That's such a milestone in blogging, I'm happy to have 'met' you through blogging:) I started my blog for very similar reasons to show that you don't have to spend lots to have great style and hopefully inspire other women along the way. Great post and love that sweater! Congratulations on your blogiversary! Love that shade of blue! Happy one year!! It is such an accomplishment! Yay! Congrats on the one year mark. You really do a great job on remixing and I truly enjoy following your blog. Keep doing what your're going and here's to another year! Aw, thanks Tracy! Thank you for your support along the way & thanks for the positive reinforcement!! Congrats on one year! That is such an accomplishment. Love your look back. More power to your blog's all-important 1st year milestone - looking forward to more great things from you!!! very much appreciated Rebecca! Thanks for your encouragements!! !